CALL FOR ART: STATION ZERO - Science Fiction, Revisited. 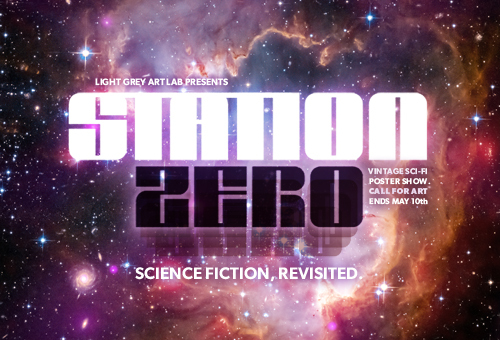 New Call For Art: Station Zero: Light Grey Art Lab's Sci Fi Show, celebrating the authors, titles and images of 1950s - 1970s science fiction. EDIT (5.11.13) Thanks so much for everyone that put your name in the hat for our STATION ZERO show! Worlds within worlds. Airtight space stations housing alien races. Biodomes covering spires built by artificial intelligence. The bridge between physics, futuristic science, philosophy and anthropology. Yes, we realize that you're not supposed to judge a book by it's cover, but judging by the covers of these books, the future of the universe is pretty sick. Over the last couple months I've been amassing a huge technicolor library of vintage sci-fi books from the 1950s through the 1970s. 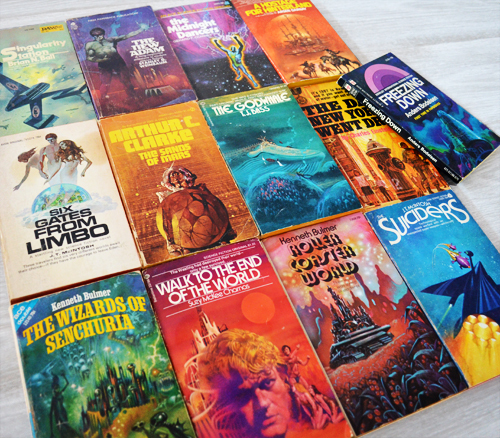 Isaac Asimov, Poul Anderson, Ursula K Le Guin and Arthur C. Clarke are just some of the names that grace the covers of these beauties. Our newest show, STATION ZERO, pays tribute to the days when writers were creating works about YEAR 2013 (Yes, this is an actual title of one of the books I have) as if we'd all be wearing stylish foil space suits while eating nutri-cubes for dinner. We're looking for artists interested in joining us in revisiting classics from this era in larger-than-life posters. If you're interested in joining us, put your name, website and email in the comments! Then! 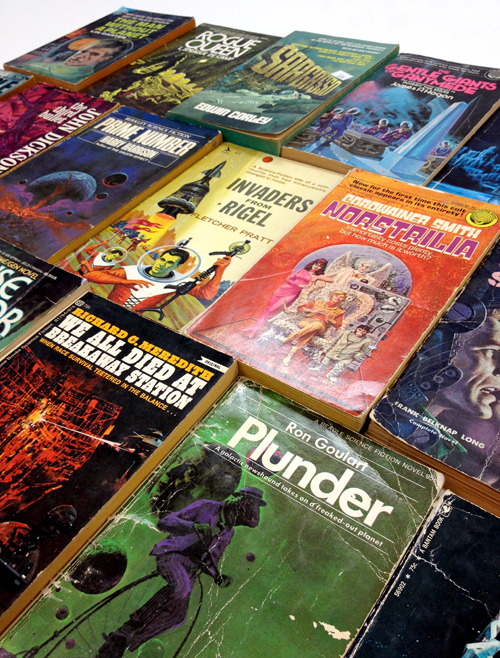 After we get our ultimate list of sci-fi artists, we'll mail all of our participating artists a unique, and amazing vintage book that you will use as the basis for your poster. There are only a couple rules for the show! 0. We'll pick a book from our library at random and send you one through the post! 1. All of the type that was included on the front cover of the original book (That includes the title, author and any other interesting phrases, prices, or notes!) should be included in your final poster. 3. This is a vintage themed sci-fi show, but you are able to interpret the art however you'd like. The final works will be showcased in the gallery and online as 18" x 24" posters alongside a mini print of the original book cover and some information about the book. And yes, you get to keep the book! Please help us spread the word to anyone that loves type, sci-fi, or posters. We're really excited about this show and hope you'll love these books as much as we do! PLEASE ENTER THE CALL FOR ART BY MAY 10th! We'll be announcing the final list of artists on May 13th! Thanks guys! We're excited about celebrating the days when everyone's space name started with a "Z". The show will be on display July 19th through August 9th!